The list of possible day trips from Merida, Mexico is long. You've got hundreds of cenotes nearby, beautiful archaeological sites, nature reserves and so many colourful colonial towns to choose from. With no shortage of things to explore near the bustling capital city, we planned a couple of exciting day trips from Merida as part of our 99 Days in Mexico series. First on the list was our visit to one of the most popular beaches near Merida. While we loved the long stretch of white sand and turquoise water, we had our eyes set on exploring beyond Progreso once we heard we could see both flamingos and pink salt flats nearby. Progreso, Yucatan is a port city located about 40 kms north of Merida and is a popular destination for beach-lovers living in Merida. Getting from Merida to Progreso is convenient, affordable and easy for anyone wanting to DIY their own day trip to the beach. There is frequent bus service from Merida to Progreso via Auto Progreso and buses depart from the station in Merida located on Calle 62 between Calle 65 and 67. The bus station is less than a 10-minute walk from the main square in town and is labelled as Auto Progeso on Google Maps. The first bus leaves at 5am and service runs all day until 10pm with buses leaving every 10 minutes or so. Tickets are purchased at the ticket booth (cash only) and the drive takes around an hour depending on traffic. We paid $36 pesos each for round trip tickets from Merida to Progreso (March 2018). Note: Because cruises frequently stop in the port, several tourists will be planning day excursions in Progreso, Yucatan. To avoid getting caught in the crowds, plan your day trip to Progreso on a day when no cruise is in port by checking this cruise ship schedule. Also keep in mind that Sundays are the busiest days on the beaches of Mexico as families gather for Domingo Familiar. Our two priorities for this excursion in Progreso were flamingos and pink salt flats. We had the option of taking a group tour from Merida to Progreso for $650 pesos each but opted out because we knew it would be better to take the local bus to Progreso ourselves and see what our options were there. Once we got off the bus in Progreso and started making our way towards the beach, we were approached for a similar tour at $450 pesos each. Knowing we could do even better, we decided to explore some of the beach and malecon first before joining a tour. At the malecon, the same tour was selling for $300 pesos but admission to El Corchito and Xcambo were not included ($405 pesos would be the total price). We thought about hiring a taxi for a few hours since that would likely come at a cheaper price and with greater flexibility but had no luck flagging one down. All of these similar tours in Progreso seemed to be about 3 hours long and were departing at 12 noon. The fours stops advertised are: El Corchito, flamingos, pink salt flats and Maya ruins which makes for an amazing day trip from Merida for less than $30 CAD. In the end, we were the only two people who signed up and had a private tour for nearly half the price as those offered from Merida! The first stop on our excursion in Progreso was possibly the most surprising part of the day. El Corchito is an eco-reserve near Progreso with cenotes, mangroves and a very family-friendly atmosphere. After a short boat ride to cross the river, we entered an area of mangroves and were greeted by dozens of raccoons. There are 3 cenotes at El Corchito, all different depths and sizes. These cenotes don't quite compare to others we've seen in Tulum and Cuzama because the water isn't as clear but I would still recommend a visit. We saw a baby alligator, lizards, lots of birds, raccoons, coatis and even those small fish that nibble at your feet. As perfect as this oasis would be for a picnic, food is not permitted in this part of the reserve and we did see a sly raccoon trying to get at someones backpack. Entrance for adults is $35 pesos (March 2018) and you'll see most of El Corchito in an hour. On site you'll find free parking, restrooms/changing area, souvenirs and a small snack bar. Our driver was there waiting for us and then off we went to the next stop on our excursion in Progreso. I know that Celestun and Rio Lagartos are considered to be the spots to see flamingos in Mexico but neither were really an option for us when planning our day trips from Merida. I spoke with a few tour operators in Merida and they confirmed that a visit to Celestun in March wouldn't guarantee huge numbers since flamingos may have already begun migrating to Rio Lagartos. I was a bit disheartened but had my fingers crossed hoping we'd still be able to see flamingos during our excursion in Progreso. And we did! Our driver knew that this was a priority for us and he offered to detour a bit so that we could see more flamingos in their natural habitat. There weren't many but they were feeding far off in the distance and it amazing to see them in the wild for the first time. While planning for our day trips from Merida, I read that a large portion of the pink salt flats (Las Coloradas) near Rio Lagartos are now fenced off. Over half of the salt flats are apparently private property and can only be visited as part of a tour. We would have done it if it was still possible to swim in the pink lakes but apparently that's not the case anymore! A day trip from Merida to Rio Lagartos without a car makes for quite the long day so we took a pass and visited the pink salt flats near Progreso instead. 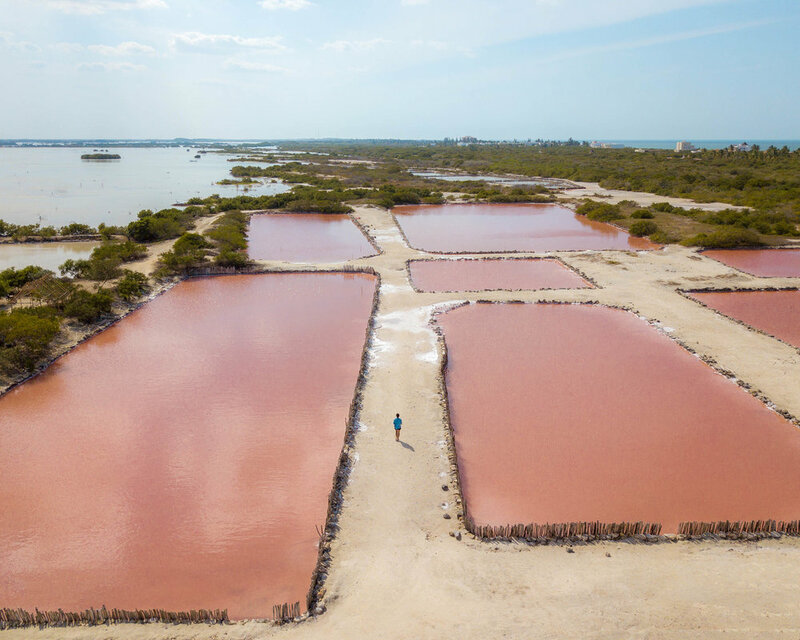 The sign outside of these pink salt flats near Progreso read: Meya’H Ta’ab SC de RL de CV, Xtampu, Dzemul, Yucatan. I believe they're commonly referred to as "Salinas de Xtampu" in Spanish. My understanding from our guide is that this is a cooperative run by locals and many of them used to work as fishermen. There weren't any other tourists around during our visit and we were invited to roam the grounds freely. The salt that is harvested here is sold in large chunks for the purpose of water purification. The salt beds are full of tiny microbes that thrive in salty bodies of water and as the sun gets higher, you can see a film of salt developing on the waters surface. The pigment in these microbes cause the beautiful pink tones of the water and also gives flamingos that pink glow they're so famous for. Entrance to the pink salt flats is free, donations are welcome and bags of salt are sold for $10 pesos. The Xcambo archaeological site is only a few minutes away from the pink salt flats and most day trips from Progreso will include this as a stop on your excursion. Unfortunately, we had spent so much extra time looking for flamingos that we ran out of time and weren't able to visit these Maya ruins. Our driver was very apologetic and we were too beat from the heat at this point to even argue. Entrance to the ruins at Xcambo was not included in our tour and we were told it would be an additional $70 pesos. It's a fairly small site and you actually may have it all to yourself when visiting which was the case during our morning at the ruins of Oxtankah near Chetumal. While some of our stops during these 99 Days in Mexico haven't quite lived up to the hype (like the sea turtles we didn't see in Akumal), our excursion in Progreso, Yucatan was a success. If you want to see flamingos in the wild, pink salt flats, cenotes, Maya ruins AND spend time at the beach all in one day, a day trip to Progreso is definitely something to consider!